The Coalville Memorial Clock Tower exhibition is starting to feel more real now. We’ve been busy for the last few weeks finding out more about war memorials in the Coalville urban area and coordinating students from North Warwickshire & South Leicestershire College and Stephenson’s College who have been taking photographs for us to use in the exhibition displays and brochure. We’ve also been putting together the itinerary for the exhibition and where possible, linking it with other events to commemorate the end of WWI in Coalville and surrounding parishes. Inevitably, our work has brought us in contact with many people who are as passionate about remembering those who sacrificed their lives for their country, as are we. 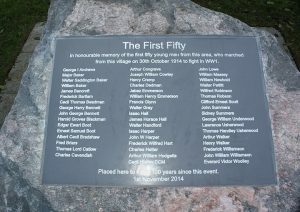 One such person is Llynda Baugh, a local author and community engagement consultant from Coalville, who is currently organising a re-enactment of the walk that the Famous Fifty (the first fifty soldiers to be enlisted from the area), took from Hugglescote to Coalville Station nearly 100 years ago. How did you get involved with sharing the stories of the servicemen from Hugglescote in the run up to the centenary of the start of WWI? In my work with local communities I came across local historian Michael Kendrick who told me that his grandfather talked about his wartime colleagues who were handpicked to make up a depleted Territorial Battalion right at the beginning of the war. One of the officers referred to them as the Famous Fifty, so he felt compelled to research each of them and the result is his book ‘Fifty Good Men and True’. As we were coming up to the centenary of the start of WW1, it made me think of the other soldiers who left after the Fifty, who did an equally important role and so Michael and I worked together to create the book ‘I’ll be home for Christmas’ – the soldiers of Hugglescote and their sacrifice in WW1. I chose this title because this is what those soldiers were told as they signed up to fight for King and Country. You subsequently went on to organise a memorial in Millfield Recreation Ground to commemorate the Famous Fifty and to plant 50 trees in their memory. Can you tell us why you felt this was important? The Famous Fifty had grown up together, worked together, trained and fought together. Ultimately, many died together and yet there was no single plaque bearing their names. They had marched from the village of Hugglescote with pride and hope for a better future and so it seemed fitting that their memorial should be in this place, in sight of the church where they held their last service. We planted fifty trees as a sign of hope for the future – that the story of the soldiers would continue and grow through the life of the trees. I’ll be home for Christmas not only includes pen portraits of the soldiers who fought in WWI, but also sheds light on the cost of the war and the social change that began after the war. Why does this interest you so much? I have always been interested in social history and of the stories of people that we can all relate to. I began to think about those left at home, the parents, the wives, sweethearts, siblings and children. Everyone knew or was related to a soldier. What effect did the war have on them and on the towns and villages that had to face the reality of their skilled workers and tradesmen being lost forever? I felt it was also important to give a brief but wider picture of how the war had started, where soldiers were recruited, why some refused to go and their treatment and the small things, like how they received gifts from home. That a cake could be baked in Hugglescote and get to the Front Line and still be fresh was a little-known fact, but the reader is now able to imagine that cake being made, using hard gained rations, and then being received by a young man longing for a reminder of home. Small stories like that remind us that the war was about real people not mass numbers. I think we both agree that learning about the impact of war on a human and personal level can have so much more impact than learning about dates and names of places you’ve never heard of. Can you tell us about a particular story which moved you? Many of the people named on memorial plaques were very young. All of them had families, lived real lives and were probably very scared once the reality of what they had signed up for became apparent. I have an uncle who served in WWII and a great uncle who fought in WW1 commemorated on the Memorial Clock Tower. I was told that my great uncle, James Bird, came home on leave and desperately didn’t want to return. He had lived on Ashby Road and had been a miner who also kept racing pigeons. He took one of the pigeons back to the Front Line with him, hidden in his great coat. When he got there, he tied a note to its leg and let it go, so it would fly home with the message to let his family know that he had arrived safely. 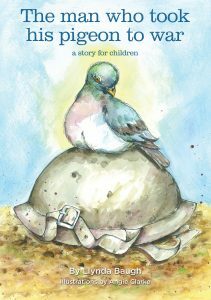 I decided to write a book about him for children as an introduction to war and remembrance. Proceeds from this book are going towards funding a gravestone for James’ brother in law, Joseph Smith, who survived WW1 and was then killed a few months after his return by a fall of coal as he resumed his job as a miner. You can buy the book via my website www.spiralprojects.co.uk/books or my Facebook page: The man who took his pigeon to war. So, what’s on the horizon to commemorate the centenary of the end of WWI? I’m delighted that Hugglescote and Donington le Heath Parish Council have asked me to work with them on their centenary commemorations for the end of WW1, for which I am co-ordinating the re-creation of the march that the First Fifty soldiers made on their way from Hugglescote St John’s Church to the railway station in Coalville. The march will take place on Sunday, 28th October 2018 at 1.50pm. We still need volunteers to march. If anyone reading this would like to be part of what will be a very poignant and proud moment in history, please visit the Facebook Page Hugglescote and Donington le Heath Remembers 1918, or email me on llynda@spiralprojects.co.uk. We hope the streets will once again be full of cheering well-wishers. We know from our project that local schools are very keen to teach their pupils about the Clock Tower and our project will be producing an education pack to help with this. How important is it for us to ensure that the younger generations understand about events which happened such a long time ago? There seems to have been a real resurgence in the interest of WW1 which has resulted in many children researching to see if they have any soldiers in their own family. This has been wonderful. Our country would have been a very different place had they not gone and sacrificed their own lives so that the children we are teaching today could be free. It is important our WW1 soldiers are not forgotten and that their story continues to pass down through generations. The Coalville Memorial Clock Tower exhibition will be available to view between September and November is community venues in and around Coalville, including at Hugglescote Community Centre following the Famous Fifty march on Saturday 28th October. Joe Ashby, a student from Stephenson College describes how he’s been assisting the Coalville Memorial Clock Tower project.